The internet can be a rough place for businesses looking to stand out from their competitors. If you’re looking for ways to optimize the local findability of your business, you’ll need to focus on cultivating brand awareness while keeping up with local SEO practices. Here are five critical tips for improving your local SEO strategy. 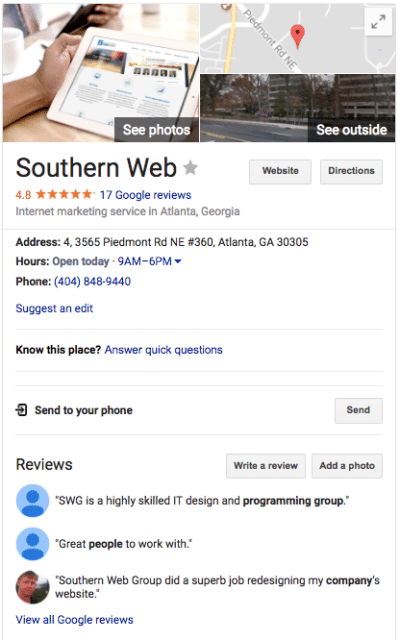 Above: The Google My Business listing for Southern Web. The number one thing you can do to optimize your local findability is to claim your Google My Business profile. Google My Business is a platform that allows businesses to manage and customize the listing that shows up when users search for your business or relevant keywords pertaining to your business. Google automatically creates your listing, which business owners can then claim through a special verification process. Once you are given access to your Google My Business account, you can control all the information and imagery related to your business, including your business description, address, hours of operation, website, contact information, and more. Claiming your listing also makes your business eligible to receive customer reviews and even respond to them accordingly. More people than ever are using mobile devices to access the internet, and as a result, Google rewards mobile-friendly websites with better search engine rankings. But what does it mean for a site to be mobile-friendly? It’s pretty simple. A site that accommodates both desktop and mobile users should load quickly, be easy to navigate, and have a responsive design. In addition to having strong, mobile-friendly website, your business should maintain active social media accounts. In addition to demonstrating to your following that your business is active, it can also play a part in local optimization. For example, if your business is involved with a local event or has recently made headlines, any social media updates you make on that subject can be pulled into search results. All content you produce should be relevant to your geographical customer base. If you mostly do business in a specific city or a region, there’s no reason to target audiences that are on the other side of the country. Being ultra-specific can also be a strategic SEO move, as it’s much easier to rank for ultra-specific keywords. For example, say you are a Nashville-based dog groomer that exclusively uses organic products. Instead of creating content that discusses “dog grooming” in a broad sense, consider honing in on a keyword like “Nashville organic dog groomer.” Being intentional in this way will help you reach your ideal customers more effectively. Backlinking is when a website links to your website. Similar to how references and citations function, backlinks demonstrate that your website is relevant and credible enough to be associated with other sites. Because backlinks are essentially “endorsements” of your site’s quality, Google’s PageRank algorithm factors in the number of backlinks to your site when determining search engine results. Natural backlinks can be challenging to acquire, which is why you shouldn’t be afraid to put yourself out there. One of the best ways to receive backlinks is to have your company featured on a news site or in a blog. The next time you host a big industry event or announce a new charitable initiative, send out a press release and a media kit so that journalist are more inclined to write about it. Another way to get on the radar of a journalist or blogger is to give out product samples for review purposes or offer facility tours. At Southern Web, we offer local SEO services that help our clients maintain the digital presence of their business through listing optimization, online reputation management, mobile optimization, and content customization.